With summer at its peak, backyard cookouts and grilled food are back in action as regular weekend activities. At ServiceMaster Cleaning & Restoration Services, we’ve seen all kinds of simple and seemingly innocent activities turn into fire damage disasters that could have been prevented. Keep the following tips in mind when using any type of grill or barbeque this summer, whether it’s at home or in a public park. Just as you would stand by your pan in the kitchen to ensure no wandering flames catch hold of nearby flammable materials, you should do the same outside with a grill. This means that at least one person should always be watching the grill, even if there’s no food currently cooking. Fires can double in size by the minute, so it’s crucial to be extra attentive at all times. Also remember that a grill stays hot for at least an hour after use. Placing a barbeque on a non-combustible surface such as concrete is a must. 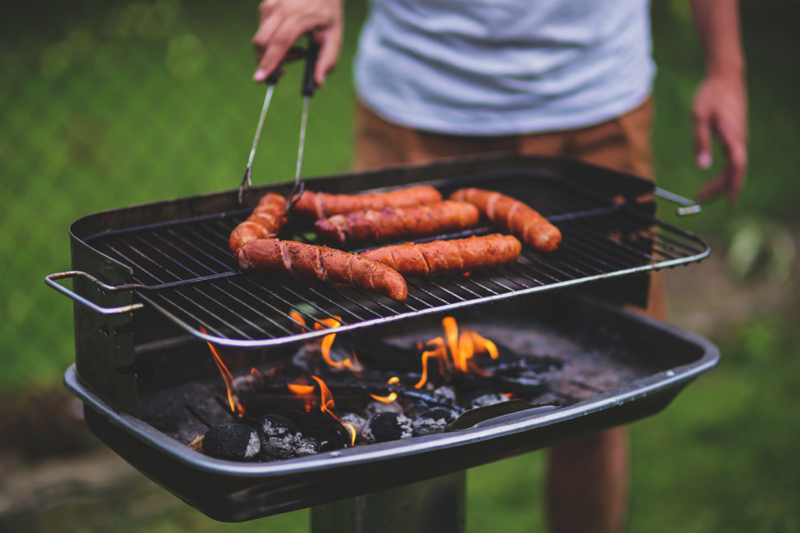 Potentially flammable materials or objects known to have combustive properties should be far away from your grill. This includes festive decorations that are often made with artificial fibers that burn fast and hot. It’s a good idea to keep a fire extinguisher nearby for emergency use. Your grill should be at least 10 feet away from the closest building, and even farther away would be better. NEVER use a grill inside, no matter how small it is. Not only because of the fire hazard but also because grills release carbon monoxide, a lethal colorless and odorless gas. Keep the grill away from wooden overhangs as well since the fire could flare up onto the overhang above. Clean your grill regularly to prevent grease and fat from building up, both of which are extremely flammable. Grease is one of the most common reasons for fires to quickly get out of control. Also regularly check for gas leaks. You can do this by rubbing a solution of water and hand soap onto the hoses and connections and then turning the gas on (with the lid open). If large bubbles form, it’s an indication that the hoses contain holes or that the connections are not tight enough. Fire safety is always important to keep in mind when cooking, especially when you consider that cooking is the main cause of home fires and fire injuries. If you find yourself in a situation where you’ve caused some fire damage or smoke damage due to a cooking mishap, don’t hesitate to call ServiceMaster Cleaning & Restoration services at (866) 856-4007. We can provide fire damage restoration and soot cleanup services for any job – big or small in New Jersey.